Today, let’s have fun. Let’s build a simple AngularJS Weather App. You might be wondering how I come up with some of my apps. I don’t see visions in my sleep nor do I hear voices from any unknown source. Some of the projects I share on my blog here, such as the Laravel Survey App, and Siya, were all inspired by a job interview. Although I am not able to complete all these projects on time or to the satisfaction of the potential employers, I end up learning so much and enjoy the experience. For a job interview, I built this simple Angular JS Weather Report app, and I’m here to share with you. I’ll be skipping the obvious points, cutting to the chase directly. So, let’s get going. Over the months and years, I’ve come to have a simple project structure for quick apps I wish to build in AngularJS 1.5. This project comes with toastr and ngProgress ready to go. I did previous tutorial on using the ngProgress you can see how it works. Go ahead and clone the project for this article, then check out to the initial commit. Follow from there, and you’re good to go. This article is not to teach you the step-by-step code involved, but share how to approach simple tasks with Angular JS and how easy the most popular Front-End framework from Google makes building single page apps a breeze. The app, in general, takes in coordinates of a place and returns with a weather report regarding the place in context. Let’s break down the above processes into simpler forms and tackle them individually. In Angular, there’s a package that wraps around Geolocation stuff you can take advantage of, namely ngGeolocation. In this project, that’s the package I used, and worked well. Simply reference the .js of the package in your index.html and do the installation requirements. The above snippet looks straightforward enough. By calling $getCurrentPosition, we’re requesting permission from the user. If the user approves, we do something withing the .then() part. The .catch() happens when an error occurs. This error could be of many forms. It could be the user requesting access, or user’s device not supporting HTML5 Geolocation. Whichever the case, we’re able to fall back to doing things manually. We’ll see how to do manual things soon. You can see the full snippet in the repository, however, we’re basically accessing the direct fields in the position object we throw into the view from the controller, which in turn was the response from the remote server we’re talking to. The doWeather() function wasn’t tucked under the resolve function of the $geolocation because we want to call the function multiple times, and don’t want to repeat ourselves. The doWeather() (what a crazy name!) also uses the openweathermapFactory which wraps around the Open Weather Map API. 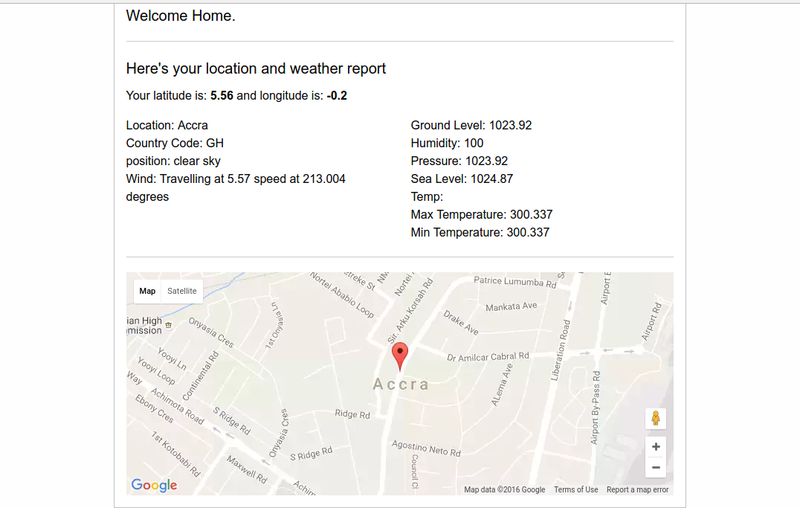 We specifically call the getWeatherFromLocationByCoordinates() to go grab the weather report using specific location we have, basically from the auto-acquired geolocation data from the user’s browser. The Open Weather API wrapper comes with other nifty functions to help save us work. You can see from the final project that we display a map. Wondering how we do so? Doing the above gives us a simple Google Maps display after we receive the coordinates from our user. The <ng-map> tag has an ng-if attribute attached Wondering why? If the map starts loading without the coordinates available, we don’t expect a proper form to render. The conditional check there ensures that part of the site regarding the map starts loading only after the coordinates are ready.